Note: This is a sample design for the MRDS1322 integrated circuit. Complete production data is available for this design. The MicroRDS Encoder is a professional full-featured FM broadcast RDS encoder module that supports basic RDS services at unmatched acquisition costs. It provides all common RDS services: Program service name, dynamic PS, Radiotext, Program Type identification, Traffic Program, Traffic Announcement and Music/Speech flags, Alternative Frequencies list and some more. 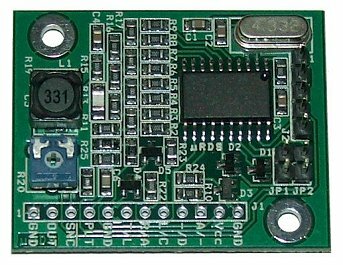 This unit is ideal for embedding into existing FM transmitter as well as for development and hobby purposes. Direct digital synthesis of the RDS signal, equipped with pilot input for optional synchronization. PS (Program Service), PI (Program Identification), PTY (Program Type), TP (Traffic Program), TA (Traffic Announcement), DI (Decoder Identification), M/S (Music/speech), AF (Alternative Frequencies), RT (Radiotext), raw User Defined Groups. Communication modes: RS-232 19200 Bd, RS-232 19200 Bd inverted, RS-232 2400 Bd, I2C 400 kHz max. The production data is available at no costs and without any limitations. This applies also to commercial use. Basic electronics skills are required for proper installation of this device! If you prefer complete plug-and-go solution rather, look at the P232. You can order the MRDS1322 part here in the section 'RDS Encoders - Parts'. The control software supports all Windows versions. After install and first opening select appropriate connection parameters on Hardware card. The software can send actual song artist and title information if your broadcast automation system provides on-air text file. In this configuration the RDS encoder can be controlled by the TinyRDS Windows application. The basic connection is extremely simple since the MicroRDS incorporates all hardware necessary. 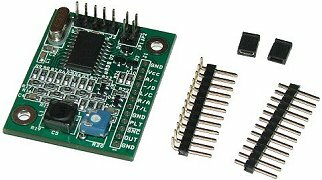 You only require a 5V power supply and standard DSUB connector. The RDS signal output that can be fed directly to RDS, MPX or SCA modulation input of your FM exciter. Download the MicroRDS User Guide for more details and other methods of connection.